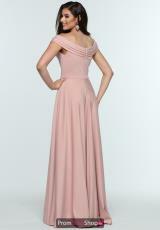 Amazing on any figure, this Zoey Grey prom dress 31347 is ultra flattering. The fitted bodice includes a radiant off the shoulder neckline that channels your inner goddess perfectly. Falling sweetly from the waist, a neoprene material flows into an a line silhouette and features a side front slit to ensure a dramatic entrance.